We took a cab this year, in order to be able to taste as many wines as possible, heh. This year’s feature country was Chile, and man, they have some delicious wines. We were offered a card to check off with the different Chilean wines to enter in a prize drawing later, which of course we forgot to do. We also entered another draw for a winery tour in Kelowna and forgot to hang around for that draw. Tasting about 40 different wines, unsurprisingly, makes you forget certain things. The night went as well as can be expected, the piles of bread didn’t seem to get eaten quite as quickly as last year. Also, my prediction that a tray full of glasses would be knocked over before the end of the night, came to fruition about five minutes after the words left my mouth. My favourite wine of the night was Cheviot Bridge Wine Co’s (Australia) moscato, very light, sweet and delicious, but unfortunately everyone else liked it too and it was sold out before we could purchase some. 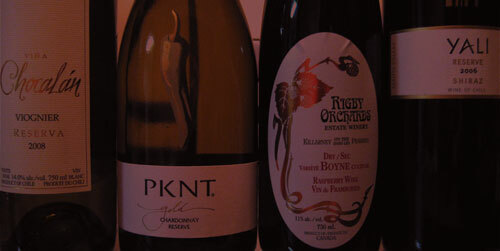 Some of the other winners however were: PKNT Chardonnay (Chile), Sileni Estates Semillion (New Zealand), YALI Reserve Shiraz (Chile), and I enjoyed the fruitiness of a light organic raspberry wine from the Manitoban Rigby Orchards. Also of mention (though Nik and I have purchased it before), is the Chocalan family of wines from Chile. After enjoying the sampling and purchasing some bottles of our favourites, we took off to Dessert Sinsations for a late dinner and cheesecake. Highly recommending the Curried Chicken Fingers there. Nik and I eat there all the time but we hadn’t tried those before and they were amazing. The meal and dessert were a brilliant cap-off to a great evening out. Quite the wine lover now…good times, good times…I’m waiting for the release of the wine label I worked on for Wild’s Gully. Hopefully it’s delicious so I will have even more excuse to drink more! Moi, I’m quite in love with the Chile wines at present. But if the Wild’s Gully is good, let us know Amb.